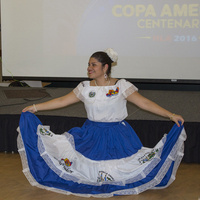 In conjunction with National Hispanic Heritage Month, this annual dinner highlights the food, music, traditions and culture of Latin America. The event is hosted by McDaniel College’s Hispano-Latinx Alliance student organization. Tickets are $15 and must be purchased in advance. For tickets or information, contact Amy McNichols, associate professor of Spanish, at amcnichols@mcdaniel.eduor 410-857-2461.